I think the rental was well maintained and well priced. The house was amazing. It was well furnished and cozy. 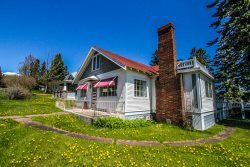 It is just a short drive from the house to Lutsen, and is very close to lake Superior. Excellent! Every step of the way Cascade Vacation Rentals was easy to do business with. All of our questions were answered promptly and thoroughly. We were sent all the information we needed to obtain access to the house. And the cherry on top was how friendly the employees are! It was hard finding a 5 bedroom house for a reasonable price, but we found it in Namaste Main. The kitchen was well equipped and roomy. There was plenty of cozy seats in the den area, with more den space down stairs. The beds were comfortable and rooms good sizes. The bathrooms were roomy with plenty of towels. My family of 8 enjoyed the home and the area with is convenient to many activities including skiing, hiking and dog sledding. Such a great anniversary weekend! This sweet little room was all we needed! Great balcony with views of the lake. When we called about the VCR we received immediate attention. Thanks! We have had god luck for years with cabins and townhomes we've rented through Cascade. Its pretty easy to rent and we are typically happy with the properties we have rented. We sty at Chateau LeVeaux a few times a year. We like the location and the price is good. We had never stayed in this unit before. The Bed was comfortable and so was the furniture. TV was fine but the DVR didn't work. However, that manager replaced it - wish we would have asked earlier. Since it was so cold out we spent most of our time in. The flooring had some loose boards that should be fixed. I tripped over the one by the fireplace. Dishwasher doesn't work well. Left dished dirty and spotted - I added the rinse aide helped a little. Not the units fault but Friday we got very little sleep - people upstairs were loud until 2:30 AM sounded like they were walking around in ski boots. Always love R and R. Our favorite place on the Lake. The Cascade staff was great! 1010 Gull Harbor was a perfect weekend get-a-way. The views were amazing and the comsp-set -up was perfect for a family of four. Your team was very helpful and willing to answer any questions that wehad before we arrived. When we checked in they were very welcoming. We lioved the house and location. The pool table was a huge hit with our family! Im sure we would have youse the bunk huse more if it hadnt been so cold. The property was beautiful! Close to the shore line with a great view. Nice cozy cabin. Great furniture and appliances. Heated floors!! We enjoyed the location of the homeclose to Grand Marais and good skiing and snowshoeing. We stayed during a time with challenging temperatures and the wood stove kept us toasty. The condo we stayed in was absolutely perfect! We were so pleasantly surprised when we walked in, as it was much prettier in person than in the pictures! It was exceptionally clean, and everything was in working order with clear instructions (e.g. the fireplace and Sonos speakers). The location couldn't have been better! The booking, check in and payment procedures with Cascade Rentals was easy. Cascade employees were also very helpful with general questions about the current snow conditions and recommendations for places to eat, rent equipment and best hikes. The house was beautiful, it was in a great location and had a true cabin feel to it. The amenities were up to date and everything worked very well. Worked through a glitch nicely. Nice winter setup. Quiet but with easy access to plowed road. Sauna a big plus. Kudos to Beth & Paul: We had an issue right away with the DVD player working . . Beth dealt with our problem promptly and Paul had us up and running very quickly and cheerfully. Thanks guys! Wonderful gathering place for a larger family . . All of us really enjoyed our stay! They have all been very awesome and helpful in making sure that I understand everything and making sure everything looks right as well as making sure we are enjoying our stay and letting us know to reach out if we need anything during our stay! This is the second time Ive stayed at the Phoenix and it was amazing if not better then the first time they House was completely decorated for Christmas and that really made us happy they go the extra mile to do things like that. The kitchen comes fully stocked with any utensils you might need to make a nice dinner. The amount of movies and board games to choose from is awesome and the beds are probably more comfortable then my own! Its always amazing time at the Phoenix! Excellent. Tami was especially helpful in helping us select a dog friendly room. The general info email contact was replied to in a timely manner. Housekeeping was friendly and happy to hear if we were having a good experience. Location was perfect, close to many great trails. The Sawbill Trail and 600 Road was a great place to x-c ski with our dogs. An old coffee maker was replaced during our stay. Silverware needed to be rinsed after dishwasher cycle. Furniture was comfortable and room was clean and well kept. It can be difficult to find a dog friendly vacation rental, but this experience was extremely easy. Rooms are clearly labeled online, and the email confirmation made it very clear that our dogs were welcome. When plumbing repairs moved us to a different room, there were still many dog friendly options. This property is honestly breathtaking. The lake was quiet, the view from the cabin was perfect. The inside of the cabin was far nicer than we were expecting. The kitchen had everything we needed to cook. Taking out the trash was no problem for us, as this is common for such a remote place. We plan on making a yearly visit! This condo is in a great location - and it's nice that it is an end unit, although the walls seem thin and we could hear the kids next door, so they could probably hear us, as well. The proximity to the lake is great. Also great that it is dog-friendly. The kitchen was pretty well equipped for a rental. This house was perfect size for 4 adults. Not sure we would have been comfortable. I love this cabin so much that I am leaving a review (for the first time in my life) two years after we stayed there, because I can't stop thinking about it when I am seeking out a place to run away to with my husband. We have since moved to Seattle, and I cannot find anything comparable to this place. The beauty and peace of no running water or electricity with the impeccable view of gorgeous Superior is very hard to beat. To anyone that is hesitant to vacation somewhere this "rustic" (I think that term is ridiculous- this is what cabins are supposed to be! ), I urge you to put aside your concerns and give it a shot. In an ever-changing techno-centric world, these places are only getting harder to find. If you've never considered staying somewhere so "off the beaten path", I urge you to have your first experience here at Sandy Beach. It has all the peacefulness of portaging through the Quetico, with the amenities of not having to bury your poo or set up your home each night. You'll at the very least leave with the memory of what it was like to be truly disconnected from industrial society, and in harmony with your surroundings. We came away with many more memories than just that- splitting wood in only our boots and underwear while the cool wind woke up our senses. Trumping to the outhouse in pitch black darkness, taking pause to listen to every noise- some big, and some frighteningly small. Best of all; running out of the cabin in the middle of the night to observe the most beautiful lightning storm we've ever experienced dance across the water- scaring us shitless, as the cabin shook beneath our feet with every triumphant crack. I could go on for hours. If I could marry this cabin, I would. I have grown up camping, portaging, and summering in a cabin just like it- and it only furthered my passion for building a cabin like this of our very own, to turn into our permanent home... the city should be the place we go to visit. The woods should be our home. Sandy Beach will make you feel the same. We called an hour before checkout to see if we could stay another night and the rep was very courteous and helpful. The house was everything we could hope for and met our needs! We had so much fun, we booked an extra night before checkout! We loved the location between Grand Marais and Split Rock. House was clean and in great condition. The property overlooking the lake is beautiful, and it was fun to be able to explore the rocks outside our door. We were two families with 4 kids and four adults, and two living spaces were ideal.